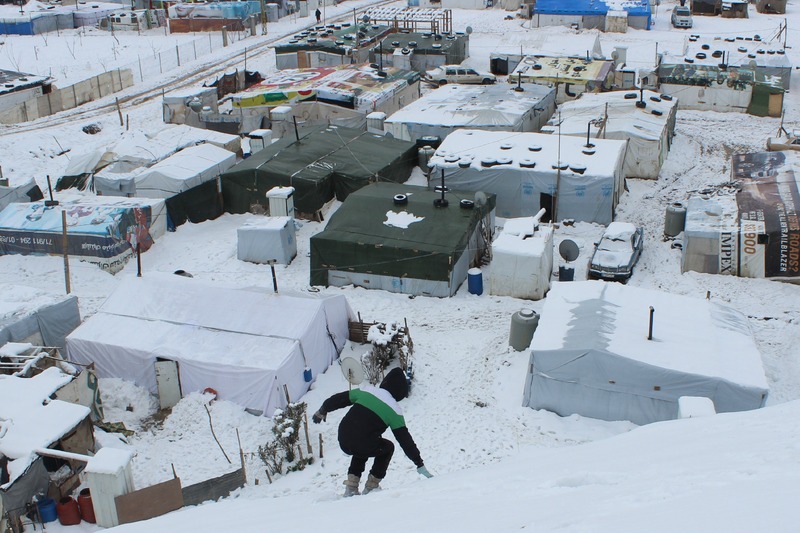 Syrian Refugees tell Syria Deeply of the conditions they endure after a blizzard hits their camp in Lebanon. Syrian refugees awoke to bitter cold last Wednesday morning. A harsh winter storm had isolated them in the town of Ersal al-Jardia in Lebanon, cutting off the roads and thus any access to medical care (there are no field hospitals in their makeshift refugee camp). Their stories convey extreme suffering and deprivation. Families in the neglected camp live in plastic tents. In some of the tents there are worn-out rudimentary stoves, along with some sheets and blankets that have no chance at keeping out the cold. Ammar Nasser, 30, lives in one of the tents. He escaped from a village in al-Raqqa to Ersal a year and a half ago. He works in building and reconstruction on sites in the towns of Baalbek and Beirut. Ammar prepares some firewood and ignites it in a metal container, while his son Nael, wearing threadbare clothes, helps him. Ammar’s wife, his sister and his five children also live in the tent. Ammar had only 120,000 lira of disposable income, so he bought some firewood from the locals. He calls it a “golden opportunity” because he managed to buy it a few days before the storm, but he says it will run out soon. “My kids got sick and they’re coughing constantly. The only thing their mother could do to make up for the lack of medicine was to boil some tea with cinnamon sticks.” He says they don’t have any medical supplies in their tent. In another tent, Jamila Bu Hamadi, 47, from Idlib, tries to melt some snow in a bowl for drinking water. She arrived in Ersal two years ago. She says they need more water and the food has started to run out. They cannot fetch more food from the NGOs and charity support centers because they’re far away, and snow is preventing the charity workers from reaching the camp. Jamila shares what she has with her neighbor 29-year-old Maryam Shiqli. Maryam came from Idlib with her husband and four children to escape from Syrian government shelling. They first lived in the northern Lebanese city of Tripoli, then moved to Ersal, where their relatives had come. Maryam doesn’t have a job and depends on her husband’s earnings at a carpentry workshop. Abdullatif Isaac, 48, who came from Talkalakh and works as a tiler and wallpaper installer, summarizes the feeling in the camp. He says the United Nations and global powers have failed the Syrian refugees.